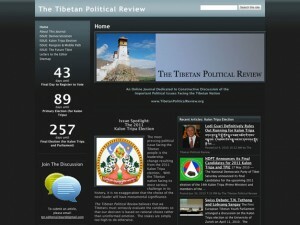 A new online journal, The Tibetan Political Review (TPR), has been launched at www.TibetanPoliticalReview.org. At a time when Tibetans are beginning to choose their next Kalon Tripa (Prime Minister), this journal aims to advance constructive discussion of the important political issues facing the Tibetan nation. The Tibetan people are confronting a series of critical issues including the Kalon Tripa election, improving democratization, independence versus autonomy, and visions for the future of Tibet. TPR is an attempt to create a forum where these issues can be subjected to reasoned, analytical, and unhampered discussion. The journal’s current featured issue is the Kalon Tripa election. TPR sets out all the nominated candidates for Kalon Tripa and their available policy positions, provides editorials and an open forum for public commentary, and offers a chance for the candidates to respond. The journal’s only rule is that unfounded personal attacks are not permitted. The journal’s goal is to ensure that political debates are about issues, not personalities. The Editorial Board members do not hold themselves out as any sort of “experts” but simply as Tibetans who hope to contribute to the national discussion and who invite all other Tibetans to join them. TPR is run by an Editorial Board consisting of Nima R.T. Binara, Wangchuk D. Shakabpa, Bhuchung D. Sonam, and Tenzin Wangyal.